The Apple Dot Matrix Printer (often shortened to Apple DMP) is a printer manufactured by C. Itoh and sold under the Apple Computer, Inc. label in 1982 for the Apple II series, Lisa, and the Apple III. It was succeeded by the ImageWriter in 1984. The Apple DMP is the last parallel port printer sold under the Apple label; all subsequent Apple printers (ImageWriter, ImageWriter II, Scribe, LaserWriter, etc.) were serial port printers. "Inside Apple Vol. 1 No. 1". * Apple (1983). "The Apple Dot Matrix Printer". Internet Archive. Retrieved August 21, 2015. 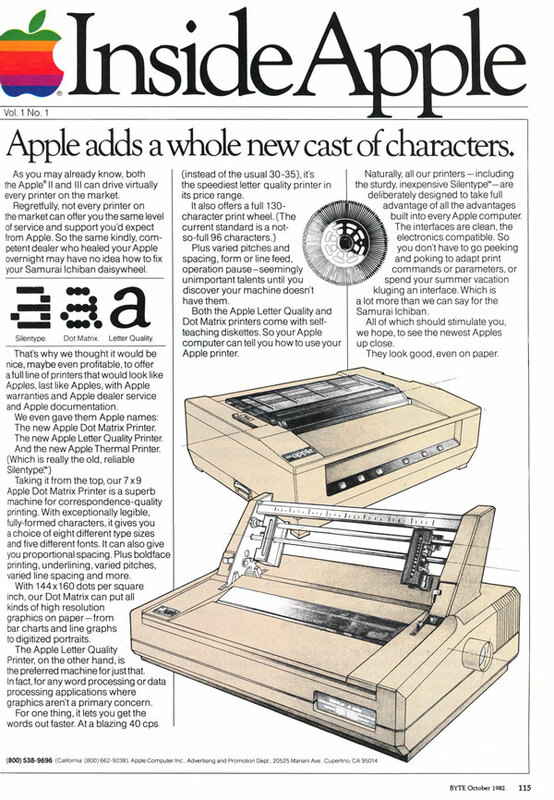 The Apple Silentype is Apple Computer, Inc.'s first printer, announced in 1979 and released in March 1980 for US$599, shortly after the Apple II Plus. The Silentype's firmware was written by Andy Hertzfeld, who later worked on the Apple Macintosh. The Silentype is a thermal printer, which uses a special paper and provides 80-column output. It was also compatible with the Apple III. The Silentype printer needs its own specially designed interface card, or an Apple III with the built-in Silentype port. It is mechanically similar to the 3M Whisper Writer 1000 and identical to Trendcom's Model 200 and the Axonix ThinPrint 80 (the first, thermal version, not the later DMP model), except for the Apple logo in the lower left corner of the front cover, but the internal digital board was completely redesigned by Apple, removing the relatively expensive microprocessor and memory chips, relying on software in the Apple II instead. It was succeeded by the Apple Dot Matrix Printer, released in October 1982 for US$699. The Silentype was inexpensive compared to other printers of the day (most of which cost over $1,000), although the printing looked very much like that produced by a dot-matrix printer. The Trendcom Model 100 printed 40 characters per line on paper that was about 4 1⁄2 inches (11 cm) wide. The Model 200 could print 80 columns per line on paper 8 1⁄2 inches (22 cm) wide. Compared to the first printer offered by Radio Shack for their TRS-80 computer (which was also a thermal printer but used a silver thermal paper), the Trendcom printers were superior. The Silentype's many dramatic advantages over other printers at the time, including silent operation, very small size, print speed and reliability, were especially well-suited for its use in the nascent point-of-sale and hospitality industries. The Silentype was the first printer to be used in any restaurant as a point-of-sale remote requisition printer to speed service. The broadening use of printers in the hospitality industry subsequently played a key role in the advancement of efficiency throughout the hospitality industry worldwide. The typical point-of-sale hospitality printer in use today, thirty years later, is a thermal printer that still mimics the way the Silentype was used when it was introduced in 1980. The ImageWriter is a product line of dot matrix printers formerly manufactured by Apple Computer, Inc., and designed then to be compatible with their entire line of computers. There were three different models introduced over time, which were popular mostly among Apple II and Macintosh owners.